Let our expert guides take you on a journey through millions of year of geological history and wonder. 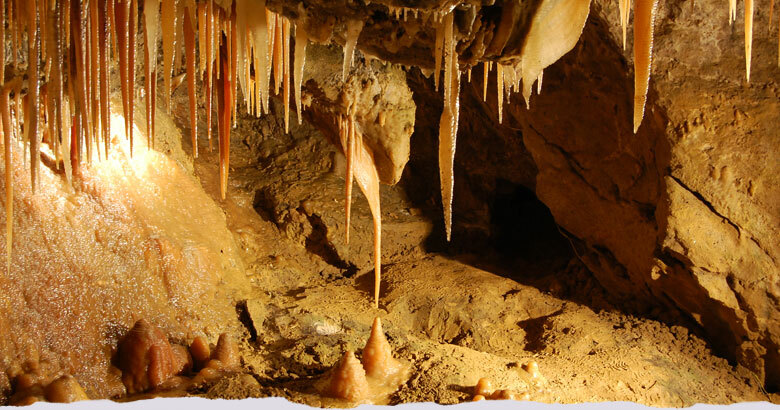 See the famous “Stork” – the result of hundreds of thousands of years of flowstone deposits, stalagmites and stalactites, the Witch’s Cave, Aladdin’s Cave with its wonderful multicoloured flowstone and much more – you might even see some bats! Each tour takes around 40 minutes and your guide will be with you every step of the way. You’re free to take photos at any time and you can even bring your dog, as long as it’s on a lead. Read more about some of what you can see on the guided tour below. Price of admission and opening times can be seen here at the foot of the page. Please note that you can only enter the caves accompanied by one of our tour guides. The original miners had to do everything by hand! 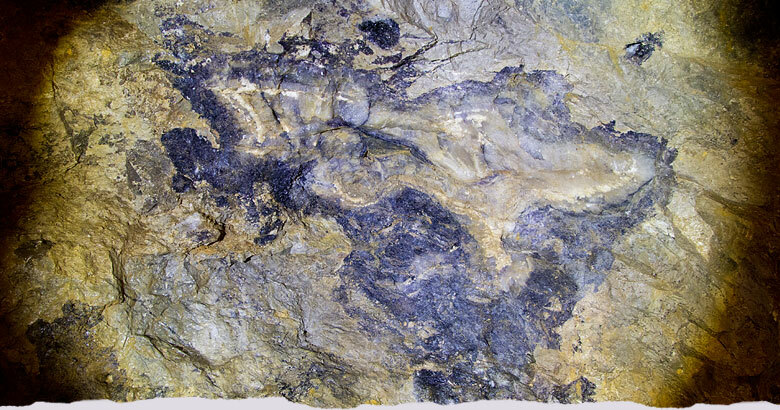 Raw Blue John deposits can be seen in the walls and ceilings of the cavern. Fossils can seen in the ceilings throughout the caves. 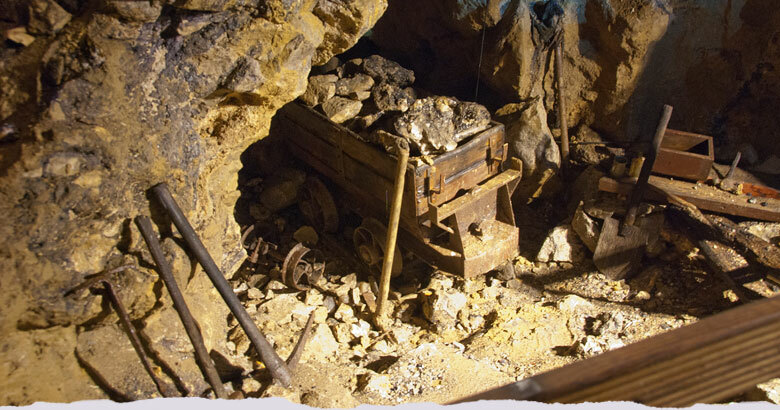 Learn how miners in the 1750’s constructed a tunnel using only hand tools to reach the Blue John Stone deposits which you’ll see inside the hill. You’ll be able to see veins of Blue John across the roof along with “The Pillar,” the largest piece ever found. 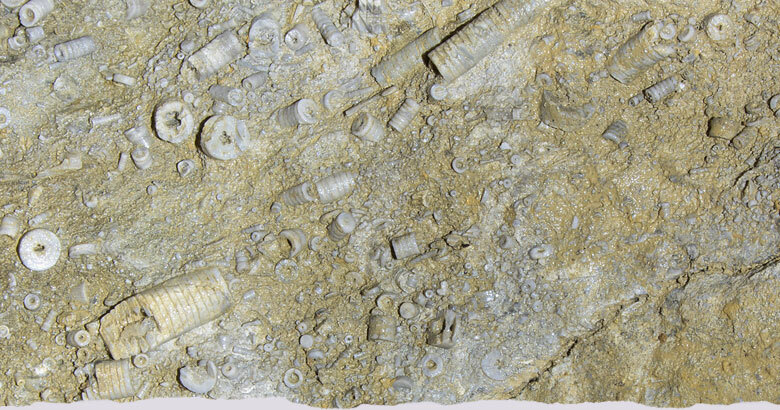 Fossils are embedded in the limestone rock which formed the hillside above you 330 million years ago, examples of which can also be seen in the museum. 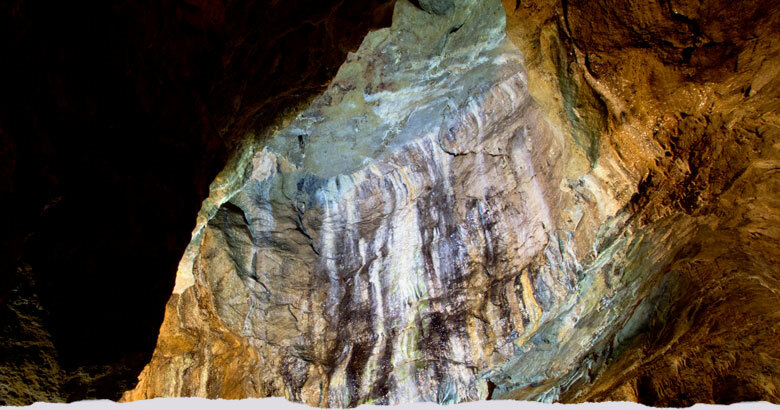 In the Witch’s Cave are even richer deposits of Blue John Stone and as you descend even deeper into the hill where you will experience the wonder of underground limestone cave formations. Multi-coloured flowstone adorns the walls of Aladdin’s Cave. Stalactites and stalagmites decorate Fairyland and the Dream Cave. The most famous formation is “The Stork” standing on one leg! 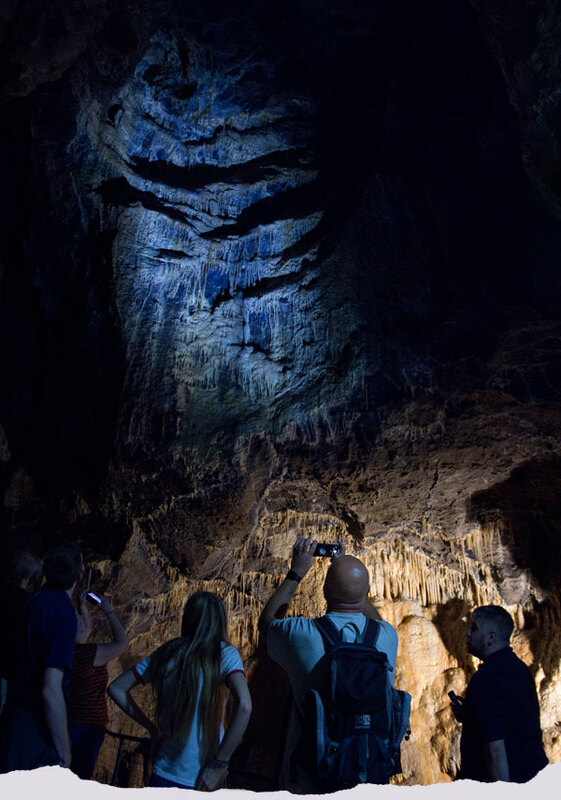 During your tour the guide will explain where Blue John Stone came from, how rushing water made the caverns and how stalactites are formed. When you finally emerge from the cavern the first thing you’ll see is a stunning view of the valley which includes Castleon, Mam Tor and Peveril Castle. The sudden contrast between this and the cavern makes the view seem even more spectacular. From here you can walk back down to the Visitor Centre and enjoy tea and coffee made from water collected inside the cavern, browse our shop where there is a selection of jewellery and ornaments made from Blue John Stone and visit the museum. Will you see a bat today? Treak Cliff Cavern has 3 species of cave bat living amongst the stalactites, stalagmites and hidden in the cracks and dark recesses of Treak Cliff Cavern exit tunnel, are a colony of European Cave spiders, called “Orbweavers”. 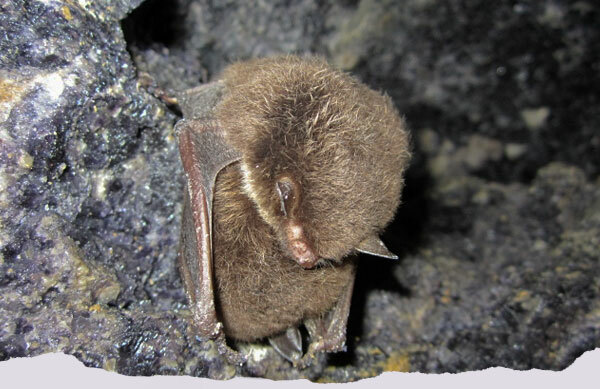 Read more about the Treak Cliff Cavern bats and spiders. The Treak Cliff Cavern “Stork” was developed over hundreds of thousands of years. In time the shape will change but not in our lifetimes – so there’s no rush! Aladdin’s cave which features remarkable, multi-coloured flowstone. Admittance to Treak Cliff Cavern is by Guided Tour only. We regret that unaccompanied visits are not possible. Tours are approximately every half hour throughout the day and last around 40 minutes. During busy periods we may run additional tours. Minimum 2 persons per tour. For more information about school visits including teachers’ resources and risk assessment please see the main Schools Page. For admission to special events such as the Christmas Carol Nights please see the main News and Events page. The last tour is at 4.20. We recommend that you arrive at around 4.15 in order to buy tickets beforehand. Because the tour finishes at the same time as the Cavern closes for the day we suggest that visitors arrive roughly 15 to 30 minutes before the start of the last tour if they would like to take advantage of the gift shop, museum and visitor centre facilities. The last tour is at 3.15pm. The Cavern is closed on Christmas Day. We are open on Boxing Day and New Year’s Day from 12.00 noon til 4pm on both days (last tour is at 3.20pm). At quiet times and to avoid disappointment if you are visiting on your own please call us on 01433 621 487 to check whether a tour will be running at the time you will be visiting. We regret that members of the public cannot visit the caves unattended; they must be accompanied by one of our guides. This is for health and safety reasons. The underground temperature is a constant 10°C (50°F) all year round so we advise that you wear suitable clothing. The cavern floor is constantly wet due to the natural underground environment; therefore suitable footwear must be worn within the underground area. Please be aware that the most ‘sensible’ footwear can cause an individual to slip. Due to the natural contours of the hillside above and below ground, the cavern is not suitable for wheelchairs. Walking disabled can be accommodated and extra helpers where necessary are allowed into the cavern at no charge. Please phone 01433 620571 or email us for further information to see how we can help. Our Risk Assessment also provides more detailed information. Dogs are welcome but they must be kept on a lead. A detailed assessment of the cavern can be downloaded from the link below. Treak Cliff Cavern Risk Assessment.